Silver miners Pan American Silver Corp. (PAAS) and Hecla Mining Company (HL) matched bearish results overnight, missing fourth quarter estimates while reporting major year-over-year revenue declines. The sobering results highlight a tough period for silver futures, which fell more than 9% in 2018. 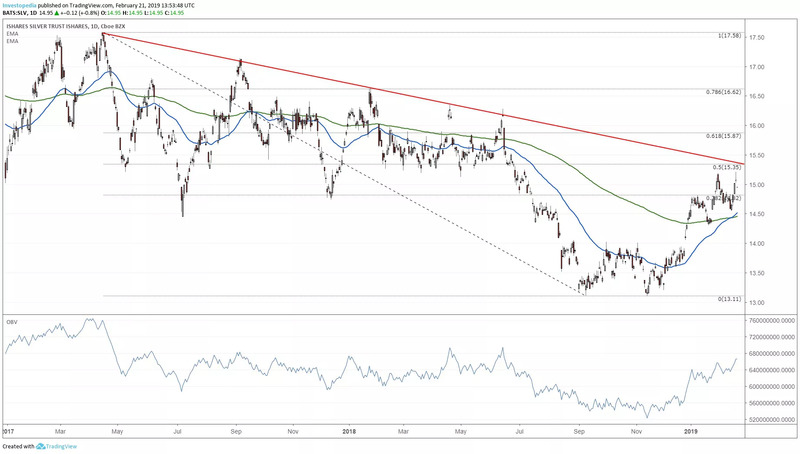 However, the technical outlook for this lesser known precious metal is brightening, with 2019 likely to book much stronger returns for speculators, hedgers and mainstream investors. Although gold and silver occupy similar investment spaces, performance in the two instruments can diverge sharply over long periods. While gold is used primarily for speculation and hedging, silver has many industrial uses, similar to copper and palladium, often trading strictly on supply and demand. However, gold and silver can also move in lockstep for months or years at a time, especially during periods of active central bank intervention. The iShares Silver Trust ETF (SLV) bottomed out at $8.45 after the 2008 economic collapse and turned sharply higher, breaking out to a new high in 2010. The uptrend escalated into a full-blown parabola before topping out in 2011 in the upper $40s, which marks the peak of the 1981 Hunt Brothers cartel on the continuous futures chart. The silver ETF broke down from a descending triangletop in 2013, entering a brutal downtrend that hit a six-year low at $13.04 in December 2015. A strong bounce stalled near $20 in August 2016, giving way to a slow-motion decline that tested 2015 support in the fourth quarter of 2018. The subsequent upturn has now mounted the 200-day exponential moving average (EMA), which has ended recovery attempts since the 2016 presidential election. Given this price structure, a breakout above the red trendline of lower highs would signal the next stage in a double bottom reversal and uptrend that could reach the 2016 high. Pan American Silver Corp. holds the second highest capitalization among the silver miners and is trading marginally lower after last night’s earnings report. It posted an all-time low at $2.41 in 2001 and took off in a powerful trend advance that reached an all-time high at $44.10 in 2008. The stock fell nearly 80 points during the economic collapse before turning higher, stalling within two points of the 2008 peak in 2011. The miner broke down from a double top in 2015 and bottomed out at a 14-year low about six months later, while the subsequent bounce posted a four-year high at $21.59 in August 2016. A shallow but persistent decline into the fourth quarter of 2018 broke two-year support near $14, while the bounce into February 2019 has been testing new resistance. Pan American Silver stock is trading at the breakdown level after the opening bell and needs to mount the October high at $15.74 to establish a new buy signal. Hecla Mining Company holds the sector’s third highest capitalization. It bottomed out at the same time as its rival in 2001 and posted a 12-year high at $13.14 in 2008. The stock dropped to 99 cents during the market crash and recovered at an equally ferocious pace, stalling within two points of the 2008 high in 2011. The subsequent decline lasted for five years before finding support in January 2016 just 46 cents above the 2008 low. The subsequent uptick stalled at the 2012 swing high near $7.00 in November 2016, ahead of another persistent decline that ended or paused at $2.17 in November 2018. It has mounted a red trendline of lower highs since that time, setting off a buying signal that hasn’t produced much upside. The stock has reversed at 50-week EMA resistance after last night’s report, advising sidelined players to keep their powder dry until a rally spike lifts above $3.07. 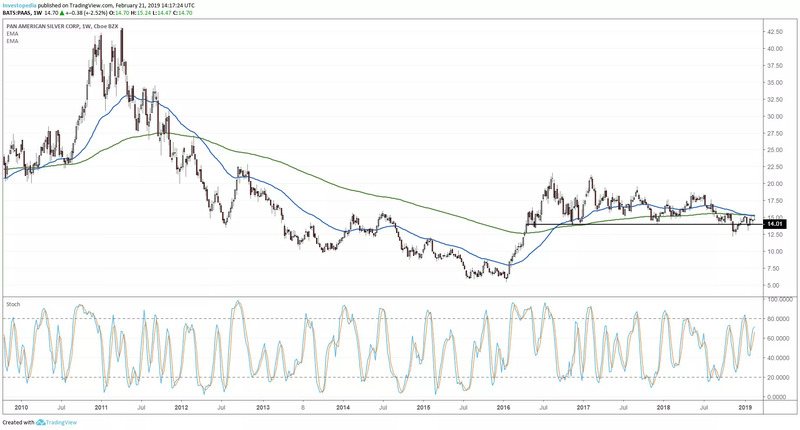 Silver has turned higher since the fourth quarter of 2018 and could enter an uptrend in the coming months. 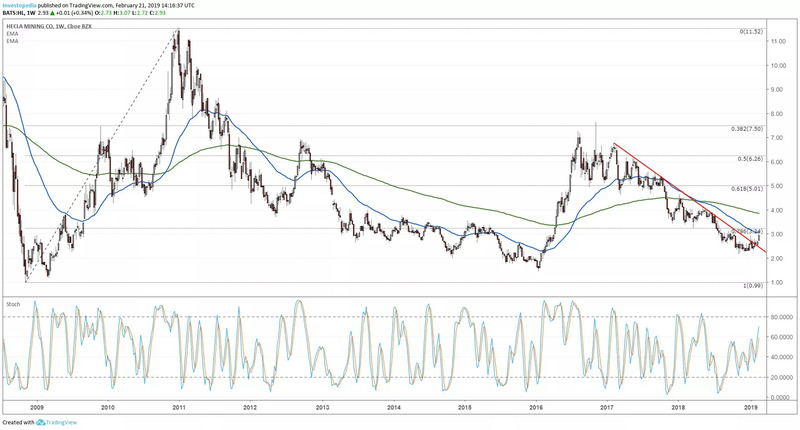 Beaten-down silver miners stand to benefit if that happens, with the potential to lift off multi-year lows. The iShares Silver Trust (SLV) was trading at $14.94 per share on Friday morning, up $0.11 (+0.74%). Year-to-date, SLV has declined -6.57%, versus a 5.01% rise in the benchmark S&P 500 index during the same period.